FishDuck.com sportswriter Austin Willhoft managed to catch up with linebacker Rodney Hardrick after Friday’s spring practice, coming away with the impression that this coming fall will be the defining season for Hardrick. After a disappointing defensive performance in the National Championship game against Ohio State, the Ducks defense looks to reload and improve despite the loss of graduates Tony Washington and Derrick Malone at the linebacker position. Hardrick stated that he has several personal goals to help improve the defense this season. 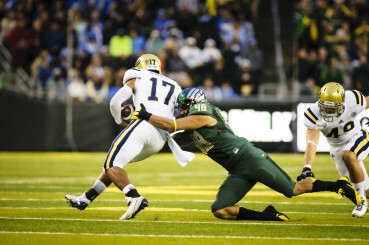 Rodney Hardrick brings down UCLA quarterback Brett Hundley. Hardrick, who recorded 75 tackles last season, 6 of them for lossed yardage, will be returning for his 5th year with the Ducks after being granted a medical redshirt in his freshman year. He will likely be paired with fellow senior Joe Walker at the inside linebacker position. As Hardrick moves up the depth chart, his role as a leader of the defense needs to grow. During spring football, players and coaches have recognized his growing leadership. Pete Martini of the Statesman Journal quoted outside linebacker Tyson Coleman talking about Hardrick’s great leadership: “He’s out there a field general all the time, no matter if he’s tired or not. I would say he’s the glue that holds us together, and everyone else just does their role,” Coleman said. The veteran linebacker group of Hardrick, Coleman, Walker and last season’s sack leader Christian French must have their best seasons yet if the Ducks want to match the physicality of any team that poses the challenge. Not only will their individual performances be tested, but also their influence on the young linebackers will play a huge part in advancing the depth of the Duck defense. Hardrick makes it a priority to influence his teammates. If Hardrick succeeds in bringing the Ducks linebackers together, their depth will pose a major problem for opposing offenses looking to impose their will on the Ducks. 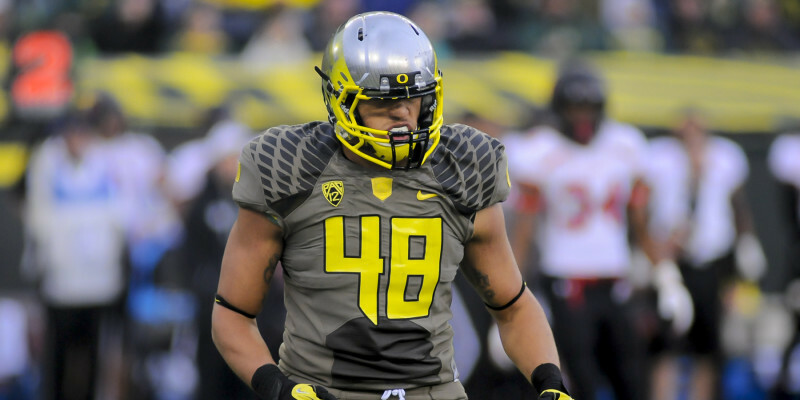 One can hope that the senior will go all-out to make his last year as a Duck his best.